Wrap Ring - Blog: Is it Wedding Season Yet?! Is it Wedding Season Yet?! We know that every bride and bride to be wants only THE best for the walk down the aisle. And, traditionally you already know the bride will adorn their bridesmaids with a prized possession for the big day. But, who said the bride was the only one who could wear a ring? 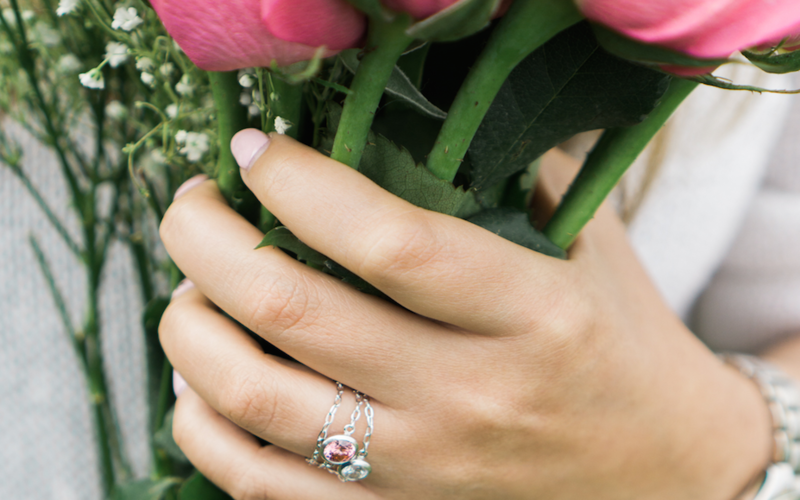 A whimsical Wrap Ring is the perfect way to bring out the enchantment of a bridesmaid dress. Even before The Big Day, the newly engaged could pop a own question of her own with a trinket to ask a best friend to be a bridesmaid! There is an assortment of six styles, and each offers at least five color combinations. Therefore a bride would be able to choose the best ring for their friend's personality and different colors that still match the color scheme! Let’s not forget about the blushing bride! There are many brides out there who prefer to leave their expensive jewelry, such as an engagement ring, at home while on vacation or traveling for business. Wrap Ring is the ideal solution because we still use only the most luxurious products: .925 sterling silver and genuine ZIRCONIA from SWAROVSKI. Each Wrap Ring is accompanied in a small, signature jewelry box which makes travel and storage a breeze. Even one of our Wrap Ring affiliates, CoveredKay flaunts her Wrap Ring as an engagement ring on the go! Wrap Ring is a flawless adornment to any outfit, and the possibilities of wrapping one, two or three rings are endless. They also are just as sparkly as a diamond ring! Wrap Ring has even been featured in Philly.com's style section, and on the hands of many brides and bridesmaids!